I’m sorry I’ve not been posting much over the last few days, as I’ve been preoccupied photographing the beauty of Scotland for a client. This, however, means one thing: I’m in Scotland, the land of open spaces, and fantastic hunting. I’ve not had much time to be out in the field, but yesterday I did finally get out and stretch my sleepy legs. My friend Frasier had seen my planned menu for my 21st of December pop-up restaurant, and offered to help me get one of the star ingredients – snipe. This little bird has a reputation of being very hard to find (and even harder to shoot), so all the help I could get in this endeavour would be greatly received. I took my employer for the week, John, along with me, as he’s a great shot, and off we set to bring home enough of these tasty little chaps. We arrived at Frasier’s moor a few miles outside Hamilton and, after a quick safety briefing, we were off with a GSP called Spencer and a border terrier called Gismo. The first patch of ground showed not a single snipe. This had us very worried, but just as we were discussing what to do if we couldn’t find any, I trod on one. They were obviously sitting very tight in the unusually bright Scottish December sunshine. Unprepared, I mounted the gun, chased after it, and missed with both barrels. We crossed over the ditch to the next expanse of moor, which immediately felt wetter underfoot. Within just a few strides, a snipe had got up in front of John. He too missed the first, but just a couple more steps and another one got up and regretted it, as John did not miss again. Our first snipe in the bag, we walked on and saw several more getting up at distance. Then John was surprised by another, and his aim was true. Rounding the corner of this stretch of boggy ground, John got another shot; not quite so lucky this time. It’s heavy-going on the wet boggy moor, kept this way by Scottish Natural Heritage because of a rare orchid that grows here, Frasier explained. With this, I fell down a hidden ditch, one leg up to my waist (much to everyone’s amusement). I got myself out, soaked to the skin, opened my gun to inspect the barrels for blockages and moved on, where I got my second chance of the day and again completely fluffed it. “Bang, bang, expletive!” I was not on form and, with a snipe dinner promised I was under pressure. A little more walking and John found his form again and accounted for another. I had one more moment of minor tourettes as I missed again (feeling like a fool, with a ribbing from both accomplices). Finally I got to put one in the bag. Missing with the first shot, I feared my swearing dictionary was going to come out again. The snipe banked right, giving me a long, but clear shot, and the second shot put my first snipe in the bag. I’ve never been so relived to hit one of these tasty little chaps. On the last leg, as the sun was setting, John got to show off his impressive low-light vision and bagged another one. 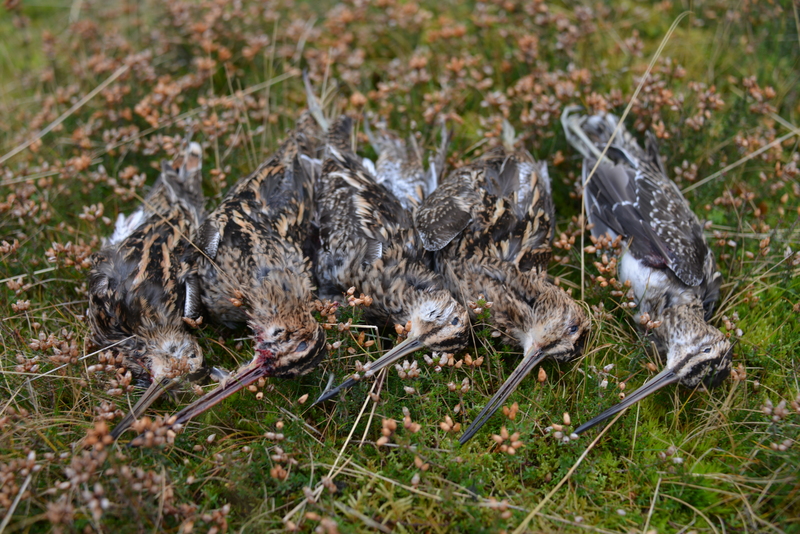 With five snipe in the bag, the pressure was off a little. I already have six orders for this dish, and with eight more guests to confirm their choices, I hope the marshes of the Essex coast back home will provide next week. It was a great afternoon walking in the fresh air, taking the pressure off my menu, and in my book, a bag of five snipe from a total of 15 shots is not unrespectable. If you liked this post please vote for me in the UK blog awards here – let’s get shooting some great coverage. 5 for 20 shots would still not be a bad ratio!! Sounds like a lot of fun, and a bath thrown in too!! !